Children with neuromuscular disorders often manifest fixed knee flexion deformity as a consequence of muscle weakness or imbalance. They tend to develop a crouch gait pattern that may prove refractory to physical therapy, bracing, or spasticity management (Botox/baclofen)  ; for those children, surgical management may be indicated. In addition to hamstring recession for contracture, fixed deformities may require posterior capsulotomy or supracondylar osteotomy. Alternatively, or in addition to these procedures, some surgeons have resorted to external frame distraction. A more recently developed approach is to utilize guided growth of the anterior distal femur to achieve safe and gradual correction of the crouch pattern. 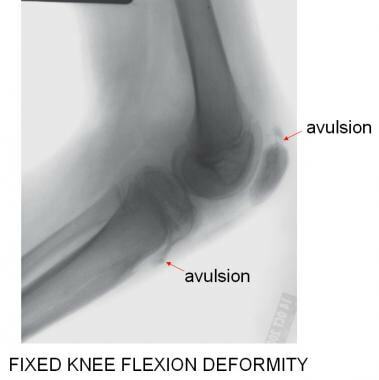 The image below depicts chronic fixed knee flexion deformity (FKFD). The lateral radiograph best demonstrates the open physes and the stigmata of chronic fixed knee flexion deformity. This patient has avulsion "fractures" of the superior pole of the patella and of the tibial tubercle. There may eventually be other methods of temporary physeal restraint. The allure of biodegradable implants or remote-control techniques by electronic or radiofrequency methodology will undoubtedly spur further research. Normal sagittal alignment permits the knee to lock in full extension, aided by powerful quadriceps and an intact extensor mechanism. The ground reaction force passes anterior to the "center of rotation" of the knee, while the PCL, posterior capsule, hamstrings, and gastrocnemius provide a tension band effect. 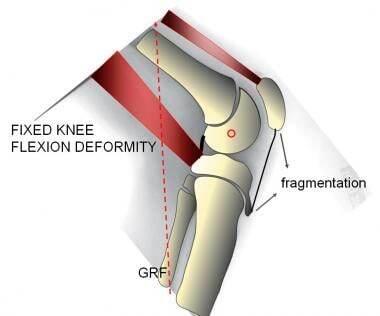 Fixed knee flexion deformity. The knee is chronically bent, obligating the patient to walk with a crouch gait. 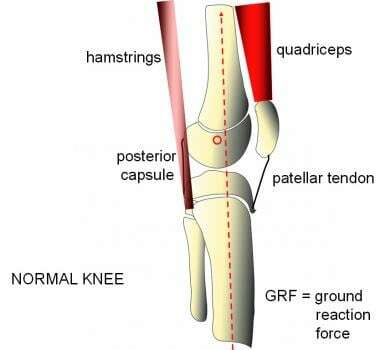 The ground reaction force passes posterior to the center of rotation of the knee, where it overcomes the resistance of the weakened extensor mechanism. Secondary effects, including patella alta and fragmentation, are relatively common and painful. Normal sagittal alignment includes the ability to lock the knee in full extension, stabilized posteriorly by the cruciate ligaments, posterior capsule, hamstrings, and gastrocnemius. This permits the child to bear full weight without pain, instability, or fatigue, because the ground reaction force is slightly anterior to the extended knee, allowing the child to lock the knee in extension during stance. In cerebral palsy, spastic hip flexors and hamstrings combine to flex the knee, causing the ground reaction force to pass behind it and produce a flexion moment. With compromise of the hip extensors and quadriceps, gravity and fatigue force the child into a progressive crouch gait pattern. [3, 4, 5, 6] Knee pain is a frequent complaint, which may reflect fatigue of the quadriceps, tension failure of the patellar ligament or its bony attachments, or both. Ankle or hindfoot valgus will contribute to lever arm insufficiency and further decrease the extensor moment at the knee. Children with spina bifida often have intrinsic weakness of the quadriceps, combined with sparing or (if tethered) spasticity of the hamstrings. This puts them at risk for the same problem of FKFD and progressive crouch gait. Compounded by ankle valgus, and perhaps planovalgus of the foot, they too have lever arm dysfunction with loss of push-off strength. Children with arthrogryposis, pterygium syndrome, and other teratologic conditions may manifest fixed knee flexion at birth, with or without congenital lateral dislocation of the patella. They often present unique challenges for the surgeon, and treatment must be individualized accordingly. The deformity may be oblique plane, including valgus or, less commonly, varus of the knee. Concurrent dislocation or stiffness of the hip and clubfoot or vertical talus may have to be addressed as well. A number of relatively common conditions, especially cerebral palsy and spina bifida, may lead to progressive FKFD, despite appropriate physical therapy and bracing. Congenital FKFD, with or without fixed lateral dislocation of the patella, may be evident on perinatal ultrasonography. Knee flexion contractures due to hamstring contractures or quadriceps weakness are prevalent in growing children with neuromuscular conditions, such as cerebral palsy, spina bifida, and arthrogryposis. A subset of these patients will develop FKFD; the frequency of FKFD is not known. This condition is a component of bilateral, multilevel deformities that may literally be the rate-limiting step with respect to functional ambulation. The natural history of FKFD is one of insidious progression despite bracing, therapy, and even repeated surgical intervention. The goal of treatment is to maintain standing and, it is to be hoped, walking ability while minimizing complications and encumbrance. One must weigh the risk-to-benefit ratio of any invasive treatment, recognizing that it may need to be repeated. Like so many conditions, it is appealing to consider early intervention, before the onset of secondary problems such as patellar migration or fragmentation. With this in mind, repeated guided growth may be the pathway of least harm and maximum benefit. In a clinical series of 18 patients with 29 cases of FKFD, the rate of correction was 1.74º per month; the highest rate noted was nearly 4º per month. Without the need for immobilization, these children have experienced rapid recovery with minimal setbacks from the surgical treatment. van der Krogt MM, Bregman DJ, Wisse M, Doorenbosch CA, Harlaar J, Collins SH. How crouch gait can dynamically induce stiff-knee gait. Ann Biomed Eng. 2010 Apr. 38(4):1593-606. [Medline]. Drefus LC, Hafer JF, Scher DM. Simulated Ankle Equinus Affects Knee Kinematics During Gait. HSS J. 2016 Feb. 12 (1):39-43. [Medline]. Arnold AS, Anderson FC, Pandy MG, Delp SL. Muscular contributions to hip and knee extension during the single limb stance phase of normal gait: a framework for investigating the causes of crouch gait. J Biomech. 2005 Nov. 38 (11):2181-9. [Medline]. Delp SL, Arnold AS, Piazza SJ. Graphics-based modeling and analysis of gait abnormalities. Biomed Mater Eng. 1998. 8(3-4):227-40. [Medline]. Wren TA, Rethlefsen S, Kay RM. Prevalence of specific gait abnormalities in children with cerebral palsy: influence of cerebral palsy subtype, age, and previous surgery. J Pediatr Orthop. 2005 Jan-Feb. 25(1):79-83. [Medline]. Williams JJ, Graham GP, Dunne KB, Menelaus MB. Late knee problems in myelomeningocele. J Pediatr Orthop. 1993 Nov-Dec. 13(6):701-3. [Medline]. Thompson NS, Baker RJ, Cosgrove AP, Saunders JL, Taylor TC. Relevance of the popliteal angle to hamstring length in cerebral palsy crouch gait. J Pediatr Orthop. 2001 May-Jun. 21(3):383-7. [Medline]. Dias LS. Surgical management of knee contractures in myelomeningocele. J Pediatr Orthop. 1982 Jun. 2(2):127-31. [Medline]. Wright JG, Menelaus MB, Broughton NS, Shurtleff D. Natural history of knee contractures in myelomeningocele. J Pediatr Orthop. 1991 Nov-Dec. 11(6):725-30. [Medline]. McNee AE, Shortland AP, Eve LC, Robinson RO, Gough M. Lower limb extensor moments in children with spastic diplegic cerebral palsy. Gait Posture. 2004 Oct. 20(2):171-6. [Medline]. Thomson JD, Segal LS. Orthopedic management of spina bifida. Dev Disabil Res Rev. 2010. 16(1):96-103. [Medline]. O'Sullivan R, Walsh M, Kiernan D, O'Brien T. The knee kinematic pattern associated with disruption of the knee extensor mechanism in ambulant patients with diplegic cerebral palsy. Clin Anat. 2010 Jul. 23(5):586-92. [Medline]. Palocaren T, Thabet AM, Rogers K, Holmes L Jr, Donohoe M, King MM, et al. Anterior distal femoral stapling for correcting knee flexion contracture in children with arthrogryposis--preliminary results. J Pediatr Orthop. 2010 Mar. 30(2):169-73. [Medline]. Sung KH, Lee J, Chung CY, Lee KM, Cho BC, Moon SJ, et al. Factors influencing outcomes after medial hamstring lengthening with semitendinosus transfer in patients with cerebral palsy. J Neuroeng Rehabil. 2017 Aug 14. 14 (1):83. [Medline]. Rodda JM, Graham HK, Nattrass GR, Galea MP, Baker R, Wolfe R. Correction of severe crouch gait in patients with spastic diplegia with use of multilevel orthopaedic surgery. J Bone Joint Surg Am. 2006 Dec. 88(12):2653-64. [Medline]. Raja K, Joseph B, Benjamin S, Minocha V, Rana B. Physiological cost index in cerebral palsy: its role in evaluating the efficiency of ambulation. J Pediatr Orthop. 2007 Mar. 27 (2):130-6. [Medline]. Gannotti ME, Gorton GE 3rd, Nahorniak MT, Masso PD, Landry B, Lyman J, et al. Postoperative gait velocity and mean knee flexion in stance of ambulatory children with spastic diplegia four years or more after multilevel surgery. J Pediatr Orthop. 2007 Jun. 27(4):451-6. [Medline]. Nene AV, Evans GA, Patrick JH. Simultaneous multiple operations for spastic diplegia. Outcome and functional assessment of walking in 18 patients. J Bone Joint Surg Br. 1993 May. 75(3):488-94. [Medline]. Gaurav K, Vilas J. A new approach to the management of fixed flexion deformity of the knee using Ilizarov's principle of distraction histogenesis: a preliminary communication. Int J Low Extrem Wounds. 2010 Jun. 9(2):70-3. [Medline]. Hoffinger SA, Rab GT, Abou-Ghaida H. Hamstrings in cerebral palsy crouch gait. J Pediatr Orthop. 1993 Nov-Dec. 13(6):722-6. [Medline]. van der Krogt MM, Doorenbosch CA, Harlaar J. Muscle length and lengthening velocity in voluntary crouch gait. Gait Posture. 2007 Oct. 26(4):532-8. [Medline]. Delp SL, Arnold AS, Speers RA, Moore CA. Hamstrings and psoas lengths during normal and crouch gait: implications for muscle-tendon surgery. J Orthop Res. 1996 Jan. 14(1):144-51. [Medline]. Devalia KL, Fernandes JA, Moras P, Pagdin J, Jones S, Bell MJ. Joint distraction and reconstruction in complex knee contractures. J Pediatr Orthop. 2007 Jun. 27(4):402-7. [Medline]. Kramer A, Stevens PM. Anterior femoral stapling. J Pediatr Orthop. 2001 Nov-Dec. 21(6):804-7. [Medline]. Muthusamy K, Recktenwall SM, Friesen RM, Zuk J, Gralla J, Miller NH, et al. Effectiveness of an anesthetic continuous-infusion device in children with cerebral palsy undergoing orthopaedic surgery. J Pediatr Orthop. 2010 Dec. 30(8):840-5. [Medline]. For flexion contracture, spasticity management (onabotulinomtoxinA/phenol/baclofen) or hamstring recession may offer some improvement, but these measures cannot overcome fixed knee flexion deformity. A posterior capsulotomy with or without PCL release can address fixed knee flexion deformity, albeit with some risks, including neurovascular stretch injuries. Even with prolonged bracing following cast or frame removal, recurrent deformities are common. Locking KAFO may support the patient for standing but cannot adequately address fixed knee flexion deformity. When the deformity exceeds 20º, braces are poorly tolerated. This child with arthrogryposis underwent unsuccessful posterior capsulotomies at age 3 years. Starting at age 4 years, this patient subsequently underwent bilateral extension osteotomies 4 times, with recurrence each time as expected. Perhaps this sequence could have been abbreviated with guided growth, which, even if repeated, requires no casts or delay in weight bearing. This ambulatory 15-year-old boy with arthrogryposis has never had an osteotomy; he was managed with stapling, followed by eight-plates, when he developed a recurrence. He has full extension on the right and 7º residual fixed knee flexion deformity on the left. The eight-plates are still in situ (on the left) pending further growth. The efficacy of floor reaction braces is compromised in the presence of fixed knee flexion deformity. However, they may be continued following guided growth, pending correction, whereupon bracing may be unnecessary, provided the quadriceps are sufficiently strong. Part 1 of 5. This 5-year-old boy presented with a congenital knee flexion deformity. His only prior surgery was a Symes disarticulation for fibular absence and a rigid teratologic foot deformity. He was ambulatory in a prosthesis. Part 2 of 5. This patient underwent a supracondylar extension osteotomy of the femur. Part 3 of 5. Because of a relatively rapid recurrence of fixed knee flexion deformity, this patient underwent anterior stapling of the femur; unfortunately, the staples migrated, but the physis is still open. Part 4 of 5. The staples in this patient were retrieved and replaced with a pair of eight-plates. Part 5 of 5. If we could turn back the clock, perhaps guided growth would have been sufficient to correct the problem in this patient, without an osteotomy or cast. The effective gain in limb length would occur gradually, without risk to the neurovascular structures. This girl born with a teratologic knee flexion deformity and absent quadriceps had previous posterior capsulotomy, supracondylar osteotomy, and attempted stapling. Subsequently, she had a spatial frame applied to gradually extend the ankylosed knee; however, she fell and sustained a Salter I fracture of the proximal tibia. Guided growth permits one to address the fixed knee flexion deformity at or close to the level of the CORA (center of rotational axis of deformity). This is efficient and prevents the need for translocation, such as is required in an osteotomy. The gradual correction poses no risk to the neurovascular structures. For fixed knee flexion deformity, an eight-plate is placed on either side of the patellofemoral sulcus, through a small arthrotomy. Though intracapsular, the plates are nonarticular; synovitis has not been observed. Depending on the etiology and the growth rate of the individual child, correction occurs fairly rapidly. With the C-arm in the lateral, horizontal position, the physis is localized. A Keith needle is placed in the physis, and two 1.6-mm guide pins are inserted: one medial and one lateral to the sulcus. The cannulated 4.5-mm screws are then inserted. They need not be parallel, but they should not transgress the physis, joint, or posterior cortex. (Images 21 and 22) This 4-year-old girl, born with congenital lateral dislocation of the patella compounding fixed knee flexion deformity (FKFD), underwent a posterior capsulotomy and patellar relocation with quadricepsplasty at age 2. By age 4, she had an oblique plane FKFD of 50º with 25º valgus. She had placement of a single anteromedial eight-plate. Eighteen months later, the valgus had corrected and the residual FKFD was 24º. (Images 21 and 22) This patient underwent the addition of an anterolateral eight-plate to avoid varus and assist with correction of the residual fixed knee flexion deformity. This 12-year-old boy with spina bifida had previous stapling. It was felt that, with wide open physes, he would be better served by exchanging the loose staples for eight-plates rather than resort to an osteotomy. (Images 24 and 25) A 12-year-old girl with evolving fixed knee flexion deformity and patella alta, refractory to onabotulinumtoxinA, serial casts, therapy, and bracing. (Images 24 and 25) This patient underwent bilateral supracondylar extension osteotomies with patellar tendon advancement. Because of limited space and compromised bone stock, fixation was lost on the left, and she presented with increased deformity. A revision osteotomy was required. (Images 26 and 27) This patient has symptomatic and painful crouch gait due to fixed knee flexion deformity. (Images 26 and 27) This patient underwent guided growth with eight-plates and no "down time"; his fixed knee flexion deformity corrected nicely during the ensuing 12 months, whereupon the plates were removed. Disclosure: Received royalty from Orthofix Inc for independent contractor; Received royalty from Orthopediatrics, Inc for independent contractor; Received honoraria from Orthopediatrics, Inc for speaking and teaching. for: Orthodox, Orthopediatrics.